As we’ve mentioned before, the market are now very much internationally focused. This is why, despite a sharp decline in corn acres of 2-4 million in 2017, end stocks are expected to stay at or above 2,000 million bushels. Near normal rains have fallen across South America in the last 30 days, and recall there was quite a drought building in Northern Brazil at this time a year ago. With the forecast favorable – in both Argentina and Brazil – through the next two weeks, there’s no indication that yields in South America won’t match or beat trend. This suggests that South America’s exportable surplus is likely to rebound 22-24 million metric tons (865-950 million bushels!) this year, and this corn will be available to world market beginning in June. Already this will weigh on the US’s share of total world corn trade. But expanding on recent discussion, the US may simply not be able to compete from economic standpoint. 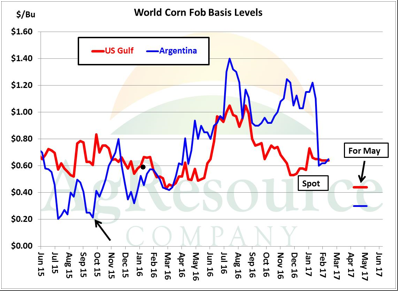 The graphic above charts basis at the US Gulf in and Argentina, and Argentine exporters in recent years have been able to sell corn into the world market at just $.15-.20/Bu over CBOT futures –a price the US has not been able to match since 2008. It’s not that the US chooses not to compete, but rather that it can’t. This is why, as the US growing season approaches, we advise selling even moderate rallies, despite potential weather scares. Again, a major change to the balance sheet (through yield loss of 10+%) is needed to alter prevailing price trends.